Join Family Story Time tonight at your Heyworth Public Library. Family Story Time is HERE for fall on Thursday evenings from 6:15 p.m. to 7 p.m. The focus is on preschool age through 1st grade children to come explore, participate in art, and enjoy stories; but the whole family is encouraged to participate in the evening’s activities. Mark your Thursday evenings from September 10 – October 22, and join us for fun times in the library Community Room with Family Story Time. After-school movies have resumed for the school year at 3:20 p.m. every Friday the library is open. Join us in the Community Room each week for a movie on our big screen with Bose surround sound. Bring your own snack, drink, and a friend! Stop in and get a flyer with all our movies being shown this fall. Do you have the hippest book bag in town? Get your very own Heyworth Public Library canvas tote – the tote bags ARE available for sale for $12.00 each. They are a great way to organize your library books for trips back and forth to the library. Also the book sale area is filling up with recent donations. So stop in and get some deals on a new to you books. September is Library Card Sign-up Month – For more information on how to sign up for a library card, visit the Heyworth Public Library in person or visit the library online at heyworthlibrary.com. September – May Winter Hours Begin: September through May library hours on Tuesdays will be 1 p.m. – 8 p.m. All other days/hours remain the same. September 10 Family Story Time kicks off for fall, 6:15 p.m. (45 minute program) September 10 – October 22: This evening is geared for pre-school through first grade, however the whole family is welcome to join in on the fun. Come explore, participate in art, and enjoy stories. September 11 After School Movies, 3:20 p.m. every Friday the library is open. Bring a friend and your own snack! All drinks need to have a screw on cap – no juice pouches or cans please. September 21 Heyworth Knitters and crafters, 1st and 3rd Mondays of each month, 6:30 p.m. -7:30 p.m. We are thrilled to offer knitters a space to create and socialize! This group is very willing to teach anyone who would like to learn to knit. We have yarn, instructions for beginning projects, and needles to get you started on a new hobby. If you want to learn how to knit you must sign up to attend, so our group can have all you need ready for the evening. If you are a knitter or a crafter looking to socialize with others in our area just show up as your schedule allows. Available to anyone 4th grade and up. September 22 Lego Block Party, 4th Tuesday of each month at 3:30 p.m. Afterschool snack, Lego games, and creative building. Sign up at the library. 1st grade – 8th grade. September 28 Monday Evening Book Club, Tiffany Girl by Deeanne Gist, 4th Mondays at 6:30 p.m. We are always looking for new people to join us! Give us a try, we have a friendly talkative bunch. It’s a great way to meet new people in town. Books in regular and large print available as well as audiobook at the library for checkout, stop in and get yours today. Would you like to start your own book club with a group of friends? We can help with book selection, and loaning the books you will need for your group. Start a book club in your neighborhood today! Stop by today and ask for details. 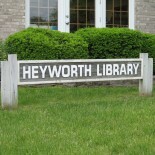 This entry was posted on September 10, 2015 by Heyworth Public Library District.